The Southend of Ocean City New Jersey is much quieter than its counterpart to the north. The South End is made up of almost all residential homes, duplexes, and quad complexes. There are less primary residents and more seasonal vacation rentals located in the Southend of OC. The Southend of Ocean City is also the most narrow part of the island. Home prices start out around $200,000 and top out over $5,000,000 for beachfront homes. The Southend also has a lot of great new construction homes on the market. For those looking for a quieter area in Ocean City, the Southend may be the spot for you. You are most likely going to have to get in the car and drive to a restaurant for meals unless you plan on cooking at home. There are numerous restaurants located on 34th St. as well as a few just over the 34 Street bridge like the locals favorite, Yesterday's Restaurant and Tavern. Two of the South Ends longest operating restaurants are Randazzo‘s Pizzeria and Blitz‘s Market. Are you looking for southend homes for sale in Ocean City NJ? Then click on the map above to view all southend homes. 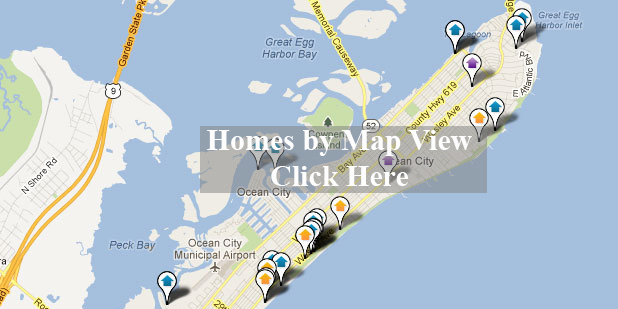 Southend homes for sale in Ocean City is our specialty. Above are just a few of the newest southend homes to hit the market. Our website provides you the ability to view all active listings in Ocean City, Strathmere, Sea Isle City, Avalon, Stone Harbor, Wildwood, and Cape May. The site is easy to use for all your property search needs. Featuring the best foreclosures, bank owned homes, land, and homes for sale at the Jersey Shore. Contact us! Sign up to the right to receive free daily email alerts as they hit the market.